Friday is here. Friday is my day off so taking five minutes to write is a gift this day. It's Friday and another chance to turn off the inner critic and simply write for five minutes. No over thinking, no editing, no worrying. Writing for the sake of writing. It's just natural. I can't help but think about the crowd. As a pastor, each week I wonder who the crowds will be who attend Sunday morning worship, and whether there will be a crowd or not. I wonder who is traveling, who is sick, who has their schedules so full that even sleep is elusive. I smile thinking about the children who will brighten our days, the children who will reach out their hands in peace, the children who will be running towards the table in awe. I wonder if a new face will bless us in worship and whether they'll feel God's presence. I hold in prayer those who we don't know and those who wouldn't even think about coming to worship. Each person and each face flash before me and I'm full of prayers. And then it's time to gather for communion. Each week the community gathers at the table to feast; to taste the bread and the wine. To fall down before God and to be surrounded in community. And it's there that I feel the power of the crowd. I look out at the faces of those present and I give thanks. I see the face of Christ before me. And I feel the power of the saints surrounding us. I don't have to look far to know that the communion of saints is with us. Before us. Among us. Singing with us. Loving us. Remembering with us. The table each week is overflowing, so much that I can't contain the crowds. So much love and grace. So much forgiveness. So much. Sometimes, things aren't always as they seem at first glance. Or more likely, the picture we have in our mind for a certain day or job or relationship, or Sunday morning worship, our ideal - our hope - doesn't pan out the way we hoped or expected. Here we are - again, the first Sunday of the month with bad weather. Weather that keeps us away, rightfully, from driving and being together in community. Weather that blankets the streets and our homes and walkways. Weather that terrorizes, a winter that has lasted way too long. This morning (even while we're ice bound) we're being led up the mountain with Jesus, a high mountain. And perhaps we're not feeling like we want to go anywhere. Perhaps Jesus has to drag us up the mountain, perhaps we can't even hear Jesus beckoning us forward with him. Maybe we've been so overcome with sickness and grief and loss that we can't move away from our own tears. Maybe we've been turned down from one job after another and we just can't bear another rejection. Maybe we've gone from doctor to doctor looking for answers and we can't handle any more changes in medicines or another diagnosis or the ongoing barage of tests and questions. Maybe we can't bear to see another storm of ice and rain and snow and ice and rain and snow. Maybe we've been studying so much and reading so much and we just can't get our minds wrapped around the lessons. Maybe we've been running from lesson to lesson and practice to practice and work and home and school, and we just can't take any more steps. Maybe we just can't figure out what to do with our future. But we are led up the mountain this morning, with Jesus, Peter and James. And here on the mountain Jesus is transfigured before them. Jesus is transformed. On the mountain. A beautiful scene in which the disciples are so moved that they want to build dwelling places on that mountain and remain there with Jesus. Their eyes have been opened and they want to remain in the glory they have witnessed. But Jesus tells them no. They must leave the mountain top. Once we've been dragged up the mountain and have seen the glory of God, we are transformed. Not by anything we've done or who we are, but because of the presence of Jesus. The experience we have on the mountain doesn't depend on the mountain, but on the abiding presence of Jesus who not only is with us on the mountain but is the One who walks us up the mountain and back down again into those valleys and shadows and darkness. Into the everyday realities of life. Jesus' light shines and we trust that Jesus is with us. On this Sunday coming close to the eve of Lent, we stand before the light of Christ knowing that we must follow into temptation and darkness on the way to the cross. 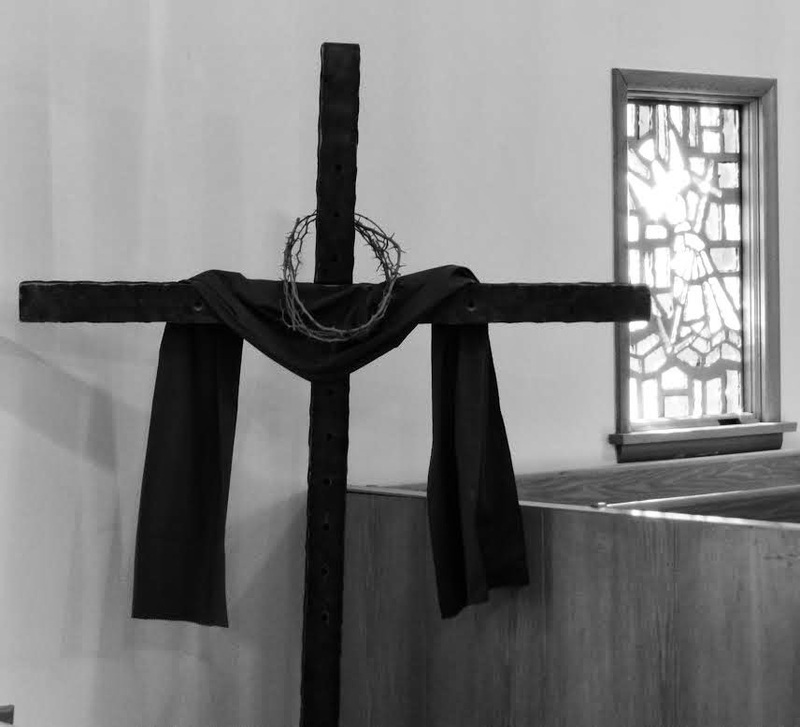 We gather on Wednesday to be marked with a cross of ashes, and to follow towards the One who has already claimed us with the cross at our baptism. Jesus who calls us forward to see the light. And so that's where I want to stay this morning, not on the mountain; No, but rather I want to stay and dwell in the persistent invitation from Jesus to go up the mountain, to be with us in light, and to walk with us down to the trenches of life. I want to stay in his unending invitation to bear witness to the light of Christ. To Jesus constantly dragging us towards him. I want to live in the unexpected blessings that come from Jesus' call to venture forward to places that are unknown. I want to live in the journey upwards where sometimes the path is rocky and only bearable with the company of friends. Some things aren't always as they seem at first glance. For here we are, surrounded by the light of one another. Stronger because of one another's faith. Jesus' invitation to each of us; Jesus who calls us to follow doesn't call us to places in which he won't walk himself. Jesus who meets us in our pain and loss and doubt invites us to life and light, Jesus who knows the crosses we bear and binds them to himself. Jesus who gives us one another.